Thank you to all who purchased a ticket for ourparent party, "A Night at the Pub" this Saturday! I am looking forward to seeing you, and I appreciate your support of our school! We will have school-wideGREENfree dressonThursday, March 15, to celebrate St. Patrick's Day and the success of our auction. Ouronline auctiongoes livetomorrow at 8 amand bidding willcontinue only until Monday night at 8 pm. There are over 150 wonderful items to bid on and the proceeds from all Parent Association events is used to bridge the gap not covered by tuition including instructional materials, field trips, and other enrichment programs. Thank you toChief Mark NagelandFBI Agent Elizabeth Wardfor coordinating a presentation for our staff last Friday afternoon onschool safety, strangers on campus, and other emergency situations. We appreciate them sharing their expertise and helping to ensure we maintain a safe campus for all our students. Fr. 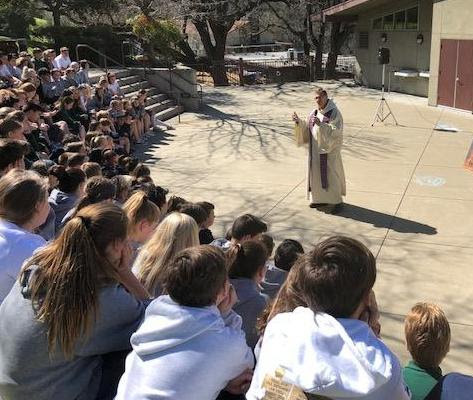 John presided over areconciliation servicethis afternoonfor our students in grades 5-8 in the amphitheatre. Your love gave the saints Perpetuaand Felicity courage to suffer a cruel martyrdom. By their prayers, help us to grow in love of you. Online Auction (link) preview tonight, bidding starts 8 am Thursday, 3/8! We still have26 unfilled yard duty slots for the months of April and May.Once you have completed your two required shiftsyou can earnone hour of volunteer timefor every additional shift you work.Please consider signing up for our open yard duty shifts!Clickherefor sign up link. Please remember that volunteers need to be 'All Clear' to do yard duty or any other volunteer functions. Since we have a low volume of weekly Scrip orders we are changing our Scrip ordering schedule tobi-weekly.ClickhereforScriporder Schedule for the balance of this school year. 2018 Yearbooks - Pre-Order Deadline Approaching! Our 2018 Yearbooks are now available byonline pre-order only. If youprepaid for a yearbook with your ONE Checkpayment youDO NOThave to place an online order. ClickHEREto complete an online order. Ordering window will close on Friday, March 29th. As St. Perpetua's parish hall is under construction, the Santa Maria Knights and Parish are graciously co-hosting ourSt. Patrick's Day Corned Beef Dinner on Saturday, March 17th!You are cordially invited to join the two-Parish celebration and feast on a delicious buffet style dinner with corned beef, 'tatties, cabbage, side dishes and beverages. Seeflyerfor details! and pick them up/sign them out in the school office. We havetwo amazingrafflesand you can purchase your ticketsHERE.Don't miss your chance to win a 7 day excursion to Ireland for the entire family! ~ Or ~ the chance to win 2 up-close tickets to the red-hot Warriors!Only100 ticketsfor each rafflewill be sold.The winners will be announced at the Parent Party, but you do not need to be present to win. Theonline auctiongoes live onThursday, 3/8 at 8:00 am! !There are too many fantastic items to list. You canpreview the items this eveningso that you're ready to bid at the 8am start! Be sure to log on early onMarch 8thand see all the exciting things up for bidding. You won't be disappointed!Online auctionends at8:00 p.m.onMarch 12th. 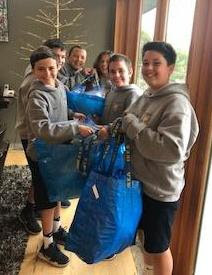 Working with Pledge to Humanity, St. Perpetua6th graders Diego, Joey, Will, Jack, Parker, and Wyatt just finished an awesome service project. Each boy gathered toiletries and blankets from their neighborhood and then the boys got together to create toiletry toes with personalized notes. These wonderful gifs were delivered to the Concord Shelter. Thank you and great job! Please join the7th gradeas they sponsor aschool-widefood drive for the Monument Crisis Center. The Center is looking forhigh protein items including:bagged beans, canned beans, canned chicken, salmon or other meats, peanut butter, etc.Please drop off donations inthe box outsideyour classroom door. The 7th graders will gather andtransport the items to the center onTuesday, March 27. Thank you for supporting this event! Students will be able to draw and color their own design using this month's theme of St. Patrick's Day. If you would like to let the school know when your games are or what your teams have accomplished, be sure to fill out a sports announcement, located at the office. Come in out of the cold and join usthis Fridayat Cafe` Perpetuawhere you can warm up while drinking a yummy latte, mocha or hot cocoa! We have heaters and inside seating, and we'd love to see you at the cafe`! Thank you for supporting your children's Garden of Learning! Join us to celebrate St. Patrick's Day for ourThird Annual Panther House Leprechaun Fun and Games on the afternoon ofWednesday, March 14th. We've got some St. Patty's snacks, including magical leprechaun trail mix, Irish soda bead and cheddar cheese. 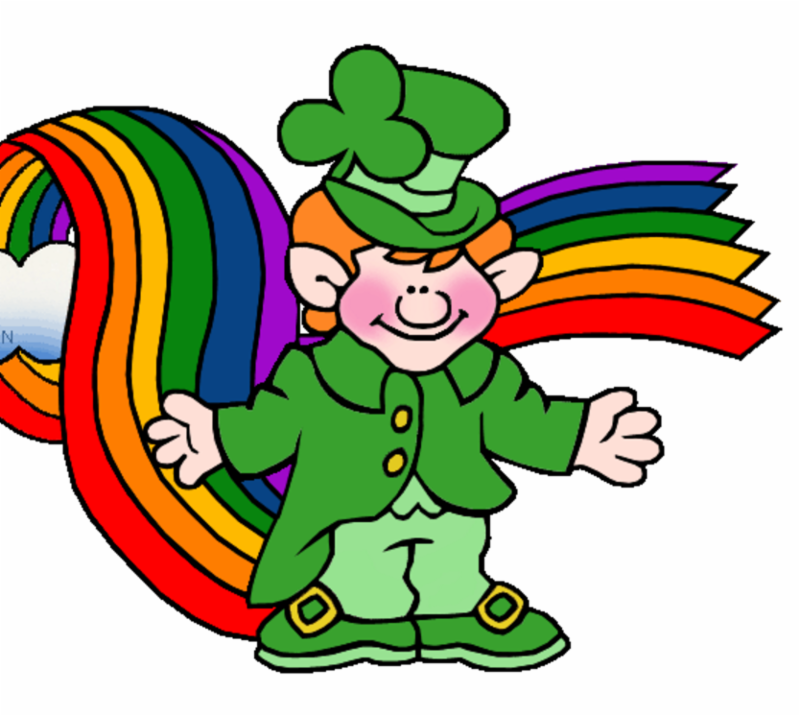 Then we'll have a leprechaun relay race and a pot-o-gold coin toss. Come over to Panther House at 3pm. We will be celebrating by keeping fit and having fun up on theGREENgrass hill, behind Panther House (weather permitting) from 3:30-4:15pm. This is available to all our registered Panther House families. Panther House fees will apply. Your child must come to us at 3:00pm. We will have snack first. Activities will be from 3:30 to 4:15. You must sign your child out from Panther House afterwards. No extra registration forms or fees are required. However you must let us know in advance if your child will be joining us that day! A monthly calendar, quick call to the office or email to Mrs. Kenney (lkenney@csdo.org) is all it takes. NO drop-ins on this day please. Spring classes will start after Easter break. Look at your child's spring activities and see if they will work in their schedules. Signup genius is open for Panther House snack donation..We've got some March dates still available.Please fill them up! Remember that you gainservice hoursfor your contribution.Remember that you gain service hours for your contribution. Thanks in advance for your help. You need to plan on enough food for 65 thankful children. Here is thesign-up link. Here are someMarch enrichment events sponsored by SEEDS! FACE (Family Assistance for Catholic Education) provides need-based tuition grants to students who attend Catholic schools in the Diocese of Oakland.FACTS is the third-party vendor that FACE uses to process and analyze all applications.The online application process is now open, and thesubmissionDEADLINE is March 19th. The Application is filled out on theFACTS website. Applications are required for ALL families requesting assistance,even if you received assistance for this current school year. If you have a question regarding grant eligibility, please contact the FACE office at510-628-2169or emailPhil Toups. 4th,and5thgrades students will havePerformance Day. This in anoptional activitywhen they canplay an instrument(I have a keyboard available),sing a song(they may bring a CD or load an audio file) ordo a dance performancefor their classmates. 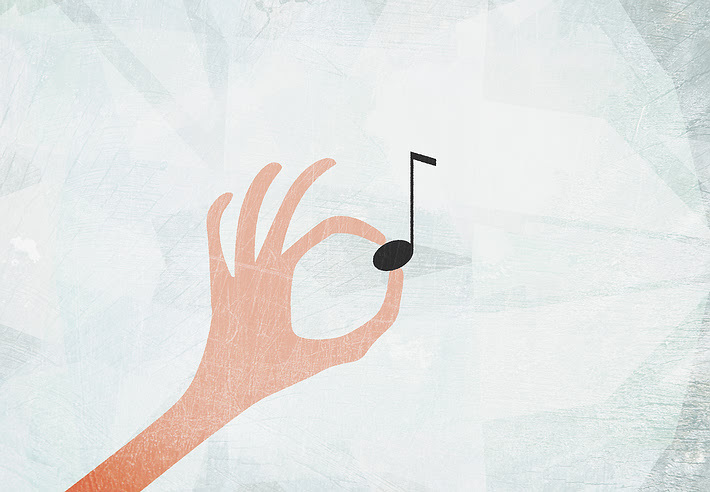 They need not prepare anything special and it need not be classical.It is intended to be a fun way to share music they know and love.Please have your students let me know this week or next week if they would like to participate and what they would like to perform. Are you looking for a fun way to become more involved in your child's classroom while earning your volunteer hours? Please consider becoming aRoom Parent for the 2018/19 school year!See theRoom Parent Formfor more information. Contact Liz Mechelkeliz_mechelke@me.comOR Monica Byersmonicabyers@yahoo.comwith any questions. I have been so impressed with the dedication and parent involvement at St. PerpetuaSchool. Whether that involvement is volunteering at the school, on the school board or behind the scenes, we must partner together to help our students succeed. 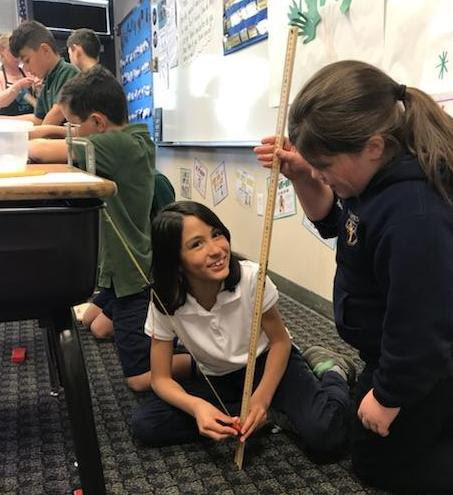 I thoughtthis articlewas a wonderful reminder of how to strengthenrespect, responsibility and relationships at St. Perpetua School.As quoted in the article, "with respect and responsibility we open the door to what is called meaningful relationship". 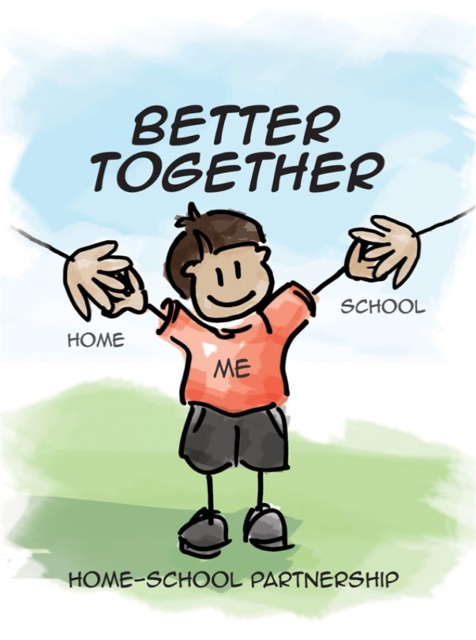 I would like to continue tobuild meaningful relationshipsbetween staff, parents and students, by planning a Parent Education evening this Spring. I have been communicating with other local school counselors, therapists and speakers to find an expert who will lead an event for our school. Continuing along the lines of collaboration and meeting the needs of our community, I would love to hear from you to hear what topics you would like to see at St. P's. Please complete thisVERY short surveyto help me meet your needs. Junior High Girls ~ Do you love Math & Science? Come to theS.T.E.M conference and workshoponSaturday, March 17th, at St. Mary's College Soda Center in Moraga. Registration opens January 19th. ClickHEREfor more information. TheBerkeley'Girls in Engineering' programis a week-long, non-residentialsummer camp for San Francisco Bay Area girls entering 6th, 7th, and 8th grades to explore different aspects of what it means to be an engineer in a fun, hands-on environment. Girls will learn leadership skills such as goal setting and effective communication, and engage in activities that showcase different engineering disciplines. Participants will also design and create engineering projects throughout the week under the guidance of Berkeleyfaculty, staff, and students. Clickherefor application information. Year-end reports for Scrip participation went home with your youngest child last week. Please review the report which shows e-Scrip/Scrip Card profit, any shortfall which will be added to your March Tuition Statement, and any profit credit earned in excess of your commitment will be applied as you directed. Please contact Kim Fogartykfogarty@csdo.orgwith any questions. Since we have a low volume of weekly Scrip orders we are changing our Scrip ordering schedule tobi-weekly.ClickhereforScriporder Schedulefor the balance of this school year. St. Perpetua School relies on parents to share their time, talents and treasures. Volunteer participation is necessary as tuition revenue does not cover operating costs of the school. Parent participation also ensures the success of social events and sustains school programs.Clickherefor details.